Cereal crops: Economics, statistics and uses; Botanical aspects of cereals; Chemical components; Cereals of the world: Origin, classification, types, quality; Storage and pre-processing; Dry milling technology; Flour quality; Bread-baking technology; Malting, brewing and distilling; Pasta and whole grain foods; Breakfast cereals and other products of extrusion cooking; Wet milling: Starch and gluten; Domestic and small scale products; Nutrition; Feed and industrial uses for cereals; Feed and industrial uses for cereals. 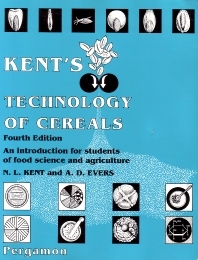 This well-established textbook provides students of food science with an authoritative and comprehensive study of cereal technology. Kent compares the merits and limitations of individual cereals as sources of food products as well as looking at the effects of processing treatments on the nutritive value of the products. The fourth edition of this classic book has been thoroughly updated with new sections including extrusion cooking and the use of cereals for animal feed.